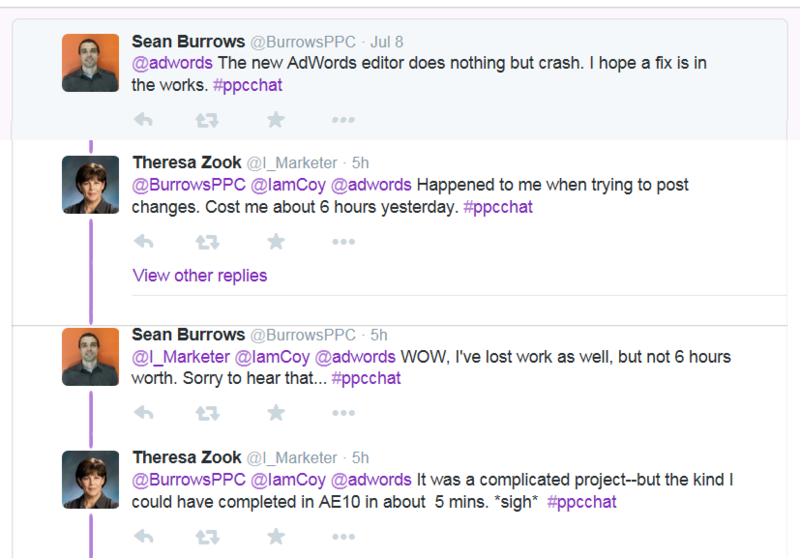 Recently, Google released Adwords Editor version 11 and sunsetted version 10. Much has been said about how great the new Editor is. It does have many features that the old version lacked, such as support for labels, shared library, and other features. Now, part of the reason I don’t like the new Adwords Editor is because I’m not a fan of forced change. We all get used to a certain workflow, and it’s disruptive and frustrating to change it. But the new Editor has several huge flaws. I noticed a few crashes when I first downloaded Editor 11, but others are still having issues. Yep, 6 hours of work lost due to this thing crashing. I probably would have jumped out the window in frustration. Or at least written a few nasty tweets to Adwords. And note that Theresa said it took 6 hours to do something that would have taken 5 minutes in the old Editor. Wow. The navigation is all messed up. 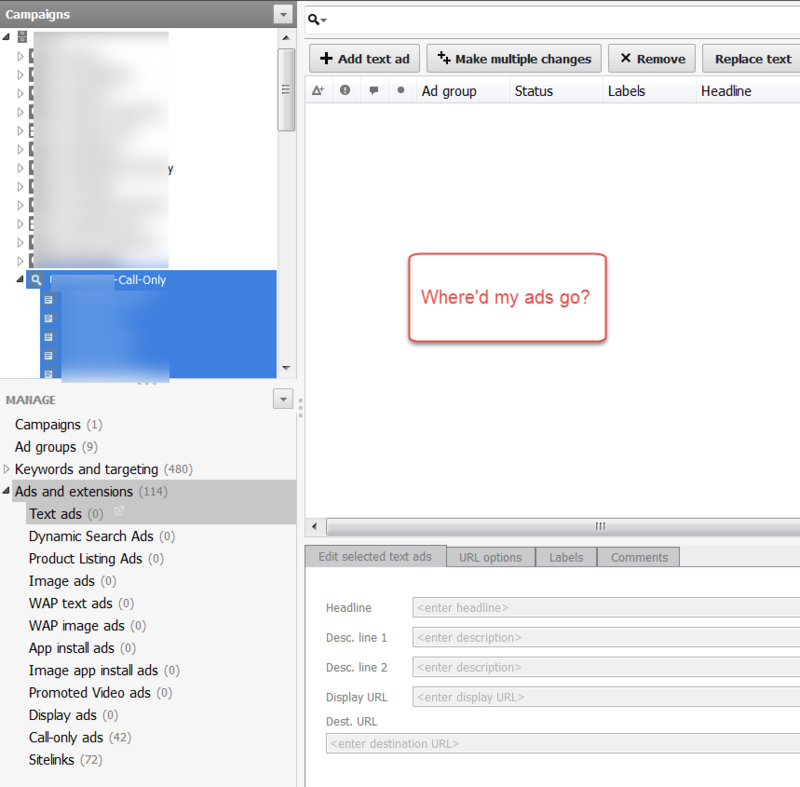 The old Adwords Editor had tabs across the top for Campaigns, Ads, Ad Groups, and Keywords, just like the online UI does. The new one moved all that stuff down to the lower left hand corner, below the tree view. Not only has it moved to a totally different location on the page, but it’s now in text only, rather than a picture-like graphic layout. It’s easier to find what you’re looking for in a graphic square, like the old Editor, rather than in a long list of text, like the new one. Speaking of finding stuff, the font in the new Editor is tiny and hard to read. I realize it may be more Google-ish-looking, but it’s so small that my old eyes have trouble, especially when I’m working in Editor all day. I think part of the problem is the font itself – there’s less kerning between the letters – and part is the fact that nothing is graphic, so the eye isn’t drawn to anything. Menu navigation requires extra clicks. Clicking on “ads and extensions” doesn’t show all your ads and extensions. It defaults to “Text Ads.” It took me several tries to figure out that I had to then click AGAIN on “Call-Only ads” to see my ads. This is 2-3 extra clicks beyond what was needed in the old Editor. Now, I’m sure I’ll get used to these lovely new features, just like I got used to Enhanced Campaigns. But right now, I’m not a fan. Especially when the workflow takes so many extra clicks. Even an extra 2-3 clicks adds up when you’re working with hundreds of ad groups. I do like being able to open multiple accounts at once, among other things about the new Editor. But it leaves a lot to be desired. What do you think? Is Adwords Editor 11 a godsend, or has it killed your workflow mojo? Share in the comments! I wish you would stop mincing your words and tell us how you really feel! Honestly, I was small part of a large beta testing group to see how usable the AW interface was. I had the exact same troubles and pointed them out loudly. I try to suppress my disdain for change and try to see the why benefit in the change. I tried the editor every day for nearly a month, and like that book you keep hoping will get better once you get in a few chapters… it continued to disappoint and I put it down. I think the main issue for me is the one you raise about the left sidebar navigation. This new column approach for both top level campaign selection AND settings for elements within that campaign is confusing. The main window presents the settings and variables for that selection. This is logical, easy and preferred. Glitches – A ton of changes not posting. Final URL, business data, and other elements getting rejected with no alert to aid. And what is with the opening up a new window for every account you want to switch to? I would like to have a choice here – I’m either moving to a new client account or for some reason I want to have two client account windows open. So thanks again Mel for sounding out the truth. Without it we won’t get real changes. Excellent explanation, Jerry, and one I totally agree with. The navigation is clunky and lacks visual cues to help the user. The glitches are icing on a very disappointing cake. Thanks as always for your comment! One more big miss. As far as I can tell the ability to export and HTML file of the campaign for clients to easily review is gone. OUCH. You’re right, I’ve heard from others that this is missing. Crazy. Add in the fact that you can’t double click anything in the tree-nav to edit it while in the ‘ads’ or ‘keywords’ section but instead have to literally go to the ‘Campaign’ or ‘Ad Group’ section. Also in ‘Make Multiple Changes’ do not hit ‘Clear’ unless you mean to clear everything you’ve got in there. I learned that the hard way when I interpreted ‘Clear’ as only clearing the cell I had highlighted. Wrong-o. I’ve now resorted to building out campaigns, etc in Excel or NotePad so I don’t waste my time with this terrible upgrade. In certain way is good to hear that I am no the only one complaining about this. I usually manage large sets of data and a week ago I had to make a huge update and it took me 2 days to finish the implementation thanks to the Google Editor ¬¬. It was a near 1 million keyword update and Editor continued crashing over and over again, until I found out that the solution was to uninstall the app, clear all the Editor’s temp files, and reinstall the app again (Windows). It seems that when it crashes it might corrupt some local files being used when opening an account, and that made me waste 2 days of my work. 2 days worth of work! That gives me a stomach ache just thinking about it. Yes, the new Editor is definitely slow and unwieldy for larger accounts – the people who need the Editor the most. Crazy. Thanks for reading! Great. I haven’t lost work like some here – BUT I just spent 3 hours to do what would have taken me half an hour in the previous version. I am moving more and more of the work out of version 11 to Excel – but everything just takes so much longer. I’ve been using AE practically every working day since the day it was released – so I thought I’d give it a chance thinking I’d get familiar with this version and see the benefits – but that just hasn’t happened. I’d go back to AE 10 in a heartbeat. I didn’t read too much of this post and the comments, but I wanted to comment because I agree with the problem of “forced change” and lack of backward compatibility. Google does not seem to understand that they provide “tools” and not something that requires constant updates and added features. I understand and appreciate improvements, but when you make such drastic changes (why does an account change require that two new windows are opened each time?) you disturb your CUSTOMERS who just need to get their work done, and don’t want to figure out where things are hiding or relearn how to do simple tasks. One comment was by a person who had the editor crash and lose about 6 hours of work. Ouch! Note to Google programmers: Move “autosave” to the top of your task list. Sure, give them an option to confirm they want to autosave. Idiots! And I still miss the old AdWords online UI. It had less features, but it was so much faster. Since they changed it I often open up different things in tabs so they can load while I work on something else. Would it kill Google to allow users to continue to use the previous version. Even if they can’t support the tool at least give us the flexibility to choose the version we prefer. Such bureaucracy as expected from a company like Google. Two hours of looking at the new AE and I cannot find one of the most valuable items that was present in earlier versions and which I used frequently to establish validity of keyword targeting. After all, there is no point in targeting keywords which nobody is using in searches where your market exists! This item was the keywords report by country or globally, which yielded a list of keywords and associated keywords/phrases actually used by searchers over the past month. Now it appears all this data is only available by signing in through a browser to something called “Keyword Planner”. Why is this no longer incorporated in Adwords Editor? Maybe I am missing something here, but this seems like a giant step backwards!